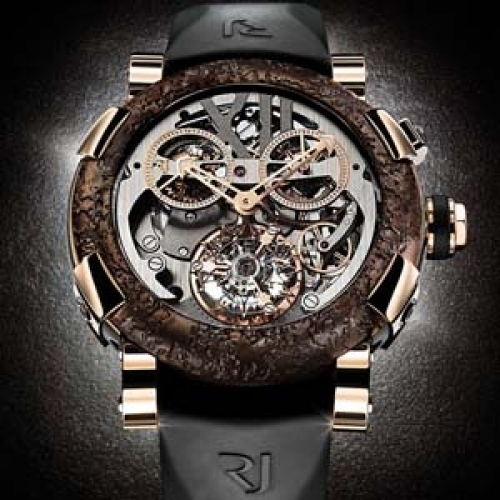 Romain Jerome introduces an ultra-virile version of its Titanic-DNA collection inspired by the giant ocean liner of which the wreck now lies 3,840 metres deep. The openworked dial reveals a skilfully orchestrated mechanism – featuring a tourbillon as well as chronograph minute and seconds counters – sublimated by a daring combination of materials: brass, steel, black gold and 5N rose gold. A genuine timekeeping instrument, this exceptional creation with its iconic rusted bezel is available in three limited editions of 9 watches each.